This week we are celebrating National Apprenticeship Week and the positive impact apprenticeships and traineeships can have on businesses, individuals, communities and on the wider economy. At Cube we believe apprenticeships truly work and recognise them as a ladder of opportunity. This is why we would encourage anyone from school leavers to college graduates, to those already in the workplace who are interested in the manufacturing and engineering sector and would like an alternative to the traditional university study to choose an apprenticeship as a pathway to a great career within the industry. 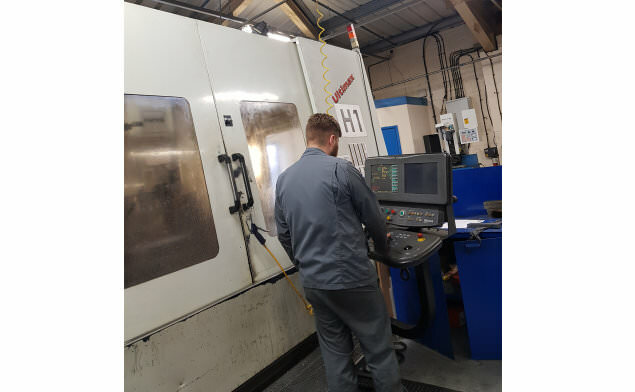 To go hand in hand with the week, we would like to share with you one of our apprenticeship stories from our Apprentice CNC Machinist, Jared Hopkins. Jared is currently in the third year of his four-year apprenticeship training programme at EEF Training Centre in Aston, Birmingham. The training centre provides high-quality training and practical courses on the use of machinery and equipment, designed specifically to help the manufacturing and engineering sector to evolve and innovate. The training plan and qualifications Jared is working towards are both tailored specifically to suit his job role as a CNC Machinist. The qualifications he will gain on completion of his apprenticeship are: Level 2 PEO, Level 3 in Engineering and a Level 3 NVQ Extended Diploma in Engineering Toolmaking. The role as a CNC Machinist involves Jared working with computer numeric controlled (CNC) heavy machinery, from setup to operation in order to produce tools and various parts from metal, plastic or other materials. He also makes sure the machines are set up properly, working at full capacity, are well-maintained and performs regular checks on output as well as making any necessary adjustments to the machine. The equipment used is precision machinery which cuts, drills or grinds into the materials. “When I left college, I knew I wanted to get a job as soon as I could because the university route never appealed to me. The idea of an apprenticeship was never on my mind as at the time I didn’t know much about apprenticeships or how they worked. Luckily, my Grandad spotted this opportunity for me at Cube and after spending some time looking into the job role and training scheme it seemed like the perfect opportunity for me. The opportunity not only provided me with a job, it also promised additional qualifications that I never expected to get. “Three years into my role at Cube, I am confident that taking the apprenticeship route was definitely the right decision for me as I have gained knowledge, hands-on experience in the working world, alongside training that has taught me the appropriate behaviours that match those expected from the company. All of which are invaluable when it comes to my future career progression. “The advice I would give to any apprentice would be to knuckle down and learn as much as possible from the people around you, don’t be afraid of asking questions no matter how silly you may think they sound and to be confident with the work that you are producing. Throughout his apprenticeship, Jared has continued to be an asset to our team and we are delighted with his development so far, seeing him gain new skills whilst building his confidence and aspirations. We believe the apprenticeship investment has not only benefited Jared, but it has also benefited us as a business by helping us to continue to run effectively.